Up until now, my frame of reference with airplane food is the pint-sized and often gluten-laden snacks handed out at cruising altitude. Now that I've been gluten-free for several years, I've learned to approach any air travel like a chipmunk, stashing snacks in my carry-on to ensure I'm never without safe sustenance when traveling. However, when booking tickets for my first international flight to London, I was excited to see a gluten-free option listed as the meal selection option. While I would still plan to have plenty of snacks (because I guessed there'd be a high likelihood of dairy showing up in the meal), I was excited to see what would be served, and how edible it was (or looked). 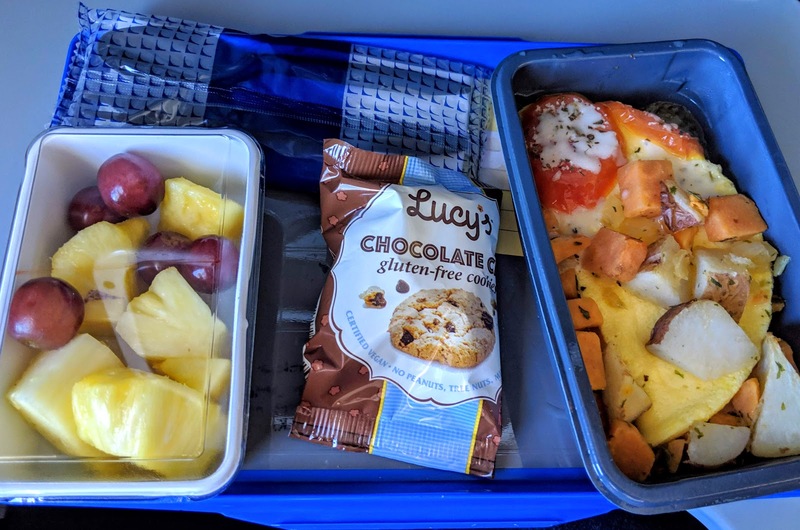 As a disclaimer, note that this post features the meals and snacks served on my February 2019 flights from DC to London. 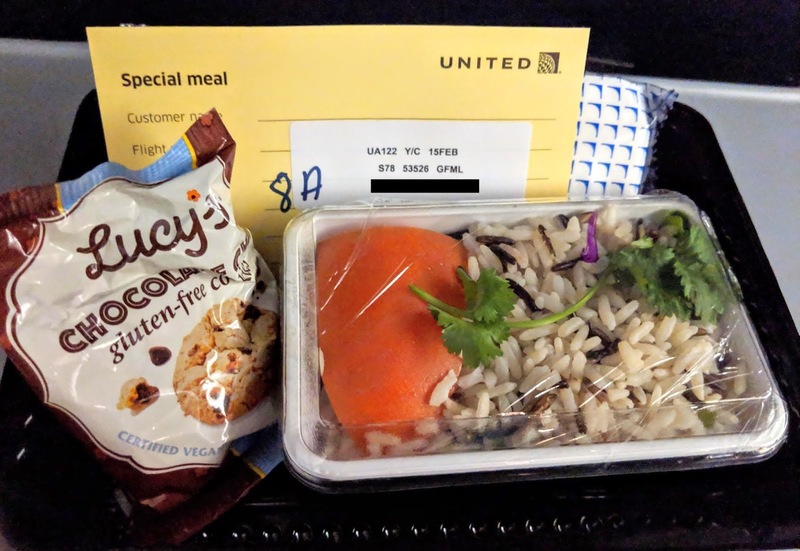 The products and meals featured on United Airlines' flights can and do vary, especially if you are flying from different airports or during different times of day, so don't assume that the experience and foods I was served will be available on your flight. 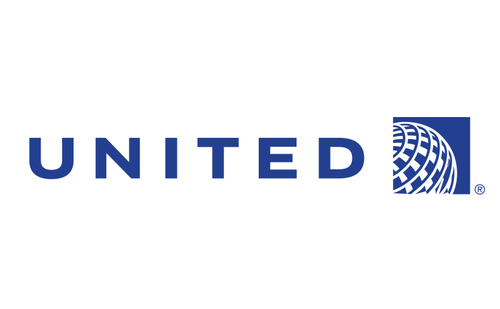 Click here to visit the airline's website about special meal selections and contact the Customer Care Center directly if you have further questions. My journey across the pond was an early morning flight, so breakfast and light snacks were served. The breakfast consisted of fruit, Lucy's chocolate chip cookies (also vegan), and an egg omelet-type creation with potatoes, tomatoes, and cheese. Because it was early and I preferred the protein bar I packed in my carry-on, I only nibbled on the fruit, as the egg dish contained dairy (and was rather unappetizing in sight and smell). I did stash the Lucy's cookie in my backpack though, it would be good to have on me if I needed a quick sugar during sightseeing the following week. 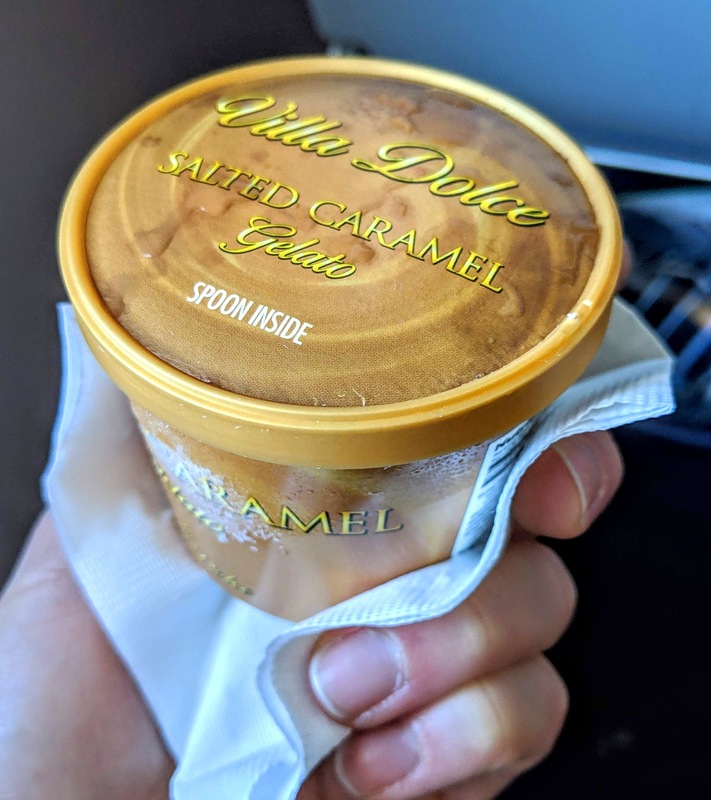 Because ice cream should always follow the first meal of the day, the flight crew handed out adorable single-serve cups of Villa Dolce gelato, which are gluten-free (but weren't marked on the package). Again, I did not sample this offering; I passed it off on a grateful traveller in the row behind me. 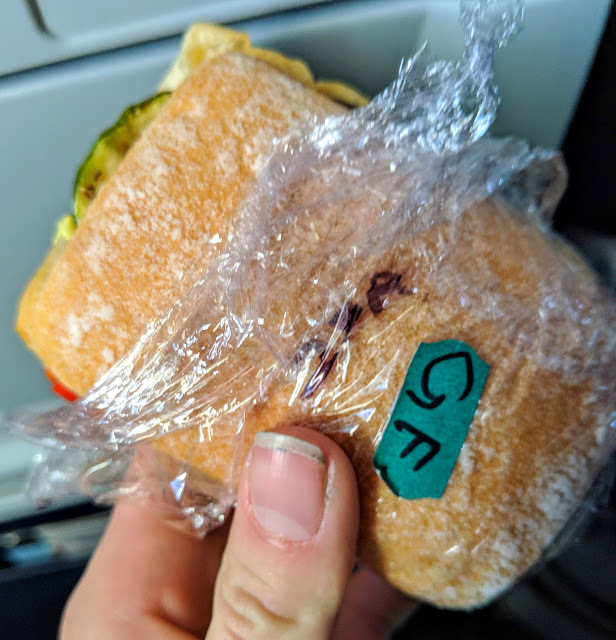 A little over an hour before landing, the flight crew handed out a final snack of sandwiches to all the passengers. Lucky me (said with sarcasm), instead of a sandwich, I got a portioning of rice with a large tomato slice. The rice was definitely on the dry side, and had no flavor, so a bite or two was all I took of this snack. Another package of Lucy's cookies were also paired with the rice, so I stashed those as well. This photo also features the special card that came with my breakfast and this snack. Overall, I was rather underwhelmed with the meal and snack options on this flight. I'm glad I had my own food on hand because this could have been a long, miserable flight if I only had these food options. If the gluten-free meal options on my flight over to the UK were lackluster, the return flight more than made up for the odd assortment of food presented on the flight over. Because I left just after noon, the main meal was a lunch course that consisted of a Thai chicken curry, fruit, marinated chickpeas, and a Schar gluten-free ciabatta role (that was dairy-free and did not contain wheat starch- a double win!). I enjoyed the melon and savory chickpeas, and stashed the Schar roll in my carry-on for later enjoyment (I made avocado toast with it the following day). The chicken curry had a label with an allergen warning that it contained fish, soy, nuts and sesame (my photo was blurry of label itself). Since it was assuredly gluten and dairy-free, I decided to eat the meal. 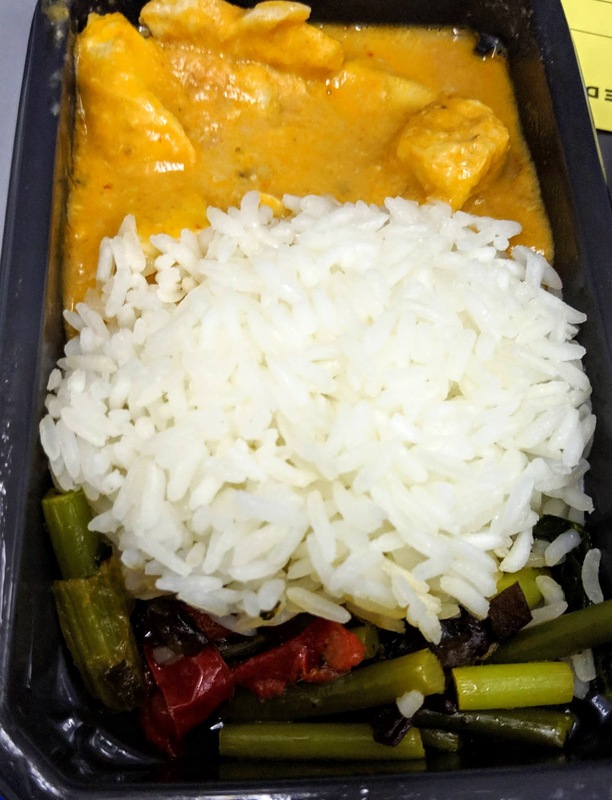 I enjoyed the rich, creamy, spicy curry with tender pieces of chicken, fragrant white rice that was actually discernible as cooked rice (unlike the snack I was served on my last flight), and featured vegetables (a food group ignored in my first flight). While not the best curry I've ever had, it more than left me satisfied and I was impressed by the flavor and quality. For the dessert course of this flight, the crew handed out a unapologetically British-inspired flavor: strawberries & clotted cream ice cream. 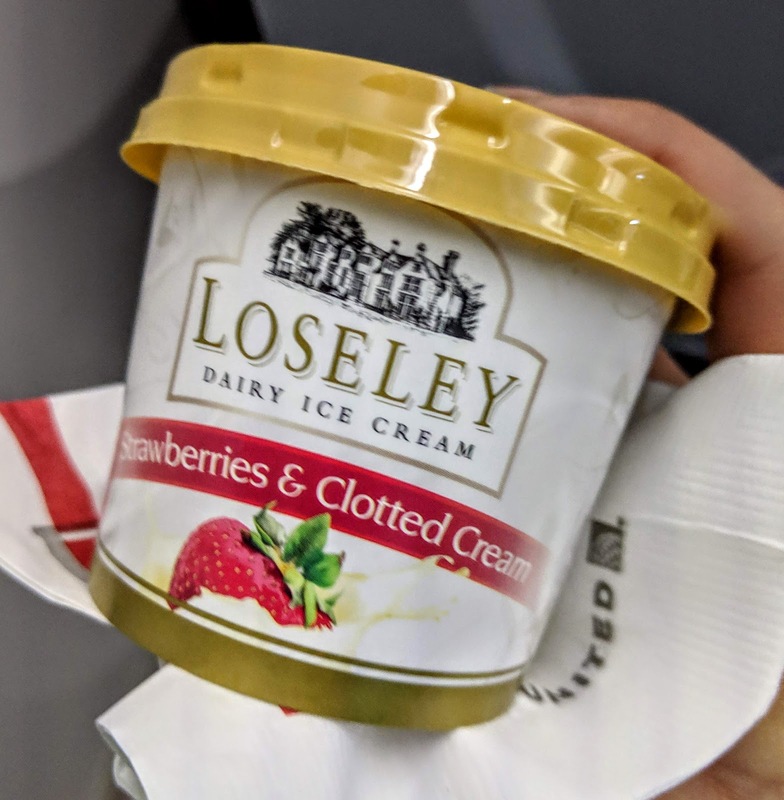 This offering from Loseley had a full ingredient list (yay!) affirming it was gluten-free, but because of the dairy content, I skipped this round again, choosing to eat one of the many sweet snacks I packed in my carry-on (more on those in a future post). 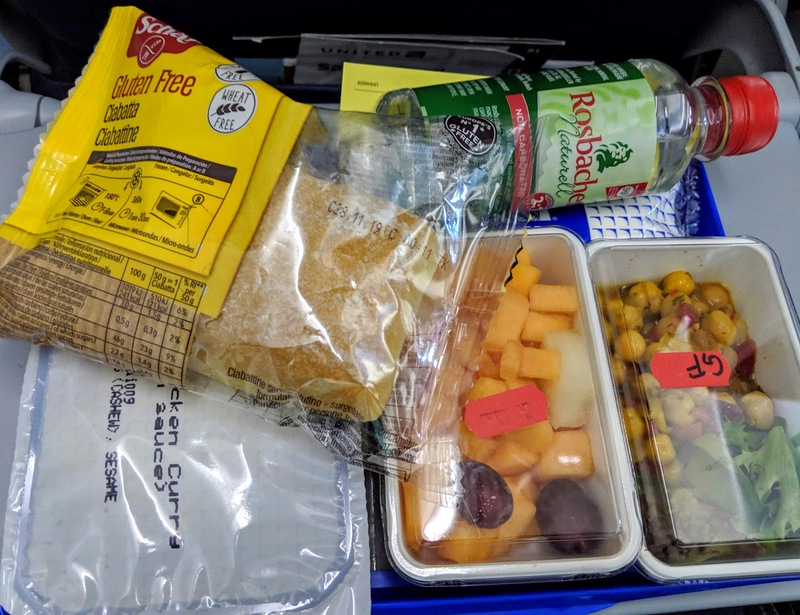 As we entered US airspace and were closing in on Dulles Airport, the final snacks served were again sandwiches, except this time I had a meal that was somewhat comparable to what everyone was serving. Made on a Schar ciabatta role, I was handed a marinated veggie sandwich which starred zucchini, peppers, and onions. While not labeled with ingredients, I did consume this sandwich, because I knew the bread was safe and it was cheese-free. While not as impressive as the lunch, I appreciated that it was an edible snack that had some thought and care put into it. If there was a time to insert a joke along the lines of "they do everything better in the UK," this is it because the quality of gluten-free options between the two flights I had was notably better on my UK-to-US flight both in quantity and labeling of ingredients. By no means will I ever get on a flight without backup food options, it was cool to be able to enjoy an in-flight meal, a first for me and the gateway to and from my first international adventure. Disclaimer: This review is based upon the information I have at the time of publication and does not reflect changes in ingredients or availability of items. Please contact the airline directly for up-to-date information and feel free to contact me with any questions or comments. I was not compensated for this post and it is a reflection of my personal opinion and experience.